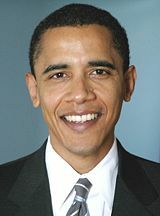 Sen. Barack Obama was born and raised in Hawaii. As a youth, he spent some time in Kenya and lived in Indonesia. He graduated from Columbia University and then moved to Chicago to become a community organizer. In 1991, he earned a law degree from Harvard University, where he became the first African-American president of the Harvard Law Review. Soon after, he returned to Chicago to practice as a civil rights lawyer and teach constitutional law. He was elected to the Illinois State Senate, where he served for eight years and in 2004, he became the third African American since Reconstruction to be elected to the U.S. Senate. In February 2007, Obama announced his candidacy for President in the 2008 election. Obama recently addressed the National Jewish Democratic Council's Washington Policy Conference. Obama was introduced at the conference by Alan Solomont of Boston, Chairman and CEO of Solomont Bailis Ventures, which launches new and innovative health and eldercare ventures. Solomont said Obama is a new voice, a new leader who will challenge the status quo, not represent the status quo. He noted that Obama is the only candidate for President who attracts new and young people in politics, and who attracts them in large numbers. Solomont called Obama "authentic" and "professional." I want to make a general point. This is not just about winning back the Presidency for a particular party or a particular politician. I think that this is about more than that. I gave a speech yesterday in Chicago where I outlined some of my views on foreign policy, and I said that we are in one of those rare moments where the American people are ready to turn the page and write a new chapter in American history and American leadership. We know these are not the best of times for America’s reputation in the world. We know that this war in Iraq has cost us an enormous amount, in lives, in treasure, in influence and in respect. And we know that over the last six years much of world opinion has turned against us. But I still believe and I think most of the people here believe that America is the last, best hope on Earth. I also believe that the disappointment that so many feel towards America right now is a testament to the high expectations that they hold for us. That people around the world want to believe in America again. The world needs us to lead because whether it is the threat of terrorism or pandemic flu, the spread of weapons of mass destruction, or global climate change, America can not meet these threats of the century alone. At the same time, the world can not meet these threats without America. Invest in the weak and failing states that are the breeding ground for terror. Yesterday, I outlined five ways I believe America can restore its leadership in the world, not because being right is important in and of itself, but because the security of our people and the prosperity of this nation depends on the security and the prosperity of all people. An America that leads will rebuild the greatest military on Earth and show the world that we will use that military wisely. We will lead by marshalling a global effort to secure, destroy and stop the spread of weapons of mass destruction. We will lead by rebuilding and reforming our damaged alliances to meet the threats of this new century. And we will lead by investing in the weak and failing states that are the most fertile breeding ground for terror. Because ensuring that those who live in fear and want today can live with dignity and opportunity tomorrow is one of the best ways for us to prevent chaos and anarchy and terrorism at its source. But before any of this can happen, one of the most important ways that America must lead is by bringing a responsible end to this war in Iraq. The President gave a press conference today in which he once again threatened to ignore the will of the American people, the Congress and the good advice of his own defense secretary by refusing to tell the Iraqi government that America will not be there forever. Our troops will not end the bloodshed in Iraq. I have said it before and I will say it again, the President’s insistence on keeping U.S. troops in the crossfire of a civil war for as long as he pleases will not end the bloodshed there or change the political dynamics in Iraq. Many of you know I opposed this war from the beginning. And in a speech five months ago I argued that there can be no military solution to what has become a civil war between Sunni and Shiite factions. I laid out a plan then that I still believe offers the best hope of pressuring these warring factions toward a political settlement – a phased withdrawal of American troops with the goal of removing all combat brigades out of Iraq by March 31, 2008. My plan also makes clear that continued U.S. commitments to Iraq depend on the Iraqi government needing a series of well-defined benchmarks necessary to reach a political settlement. So far the Iraqi government has made almost no progress in meeting any of these benchmarks, in part because the President’s determination to make our commitment in Iraq open-ended. The President’s escalation of U.S. forces can bring potentially some temporary respite from the violence in Iraq, although so far, at least, the record is not very good. But it can not change the political dynamic in Iraq and I believe that a phased withdrawal can and I believe that it needs to begin here and begin now. We have to bring a responsible end to this war because until we do it is going to be increasing difficult to refocus our efforts on the challenges of the wider region. Our involvement in Iraq has only strengthened Iran. We know that among the other consequences of this conflict, Iraq has strengthened Iran, which only undermines the security of Israel at a time when its prospects for peace seem uncertain. When I am President, the United States will stand shoulder to shoulder with Israel in search of this peace, and in defense against those who seek its destruction. But we are going to do so with the credibility to draw other nations to our cause. Without taking the military option off the table, we will use sustained diplomacy to build a true international coalition that can pressure Iran to give up its nuclear ambitions once and for all. Now, boldened by Iraq, our lackluster diplomatic efforts today leave a huge void that threatens the security of America and the broader Middle East. Out interests are best served when people and governments from Jerusalem and Amman to Damascus and Tehran understand that America will stand with our friends, work hard to build a peaceful Middle East and refuse to cede the future of the region to those who seek perpetual conflict and instability. Such effective diplomacy can not be done on the cheap, nor can it be warped by an ongoing occupation in Iraq. Instead it will require patient, sustained effort and the personal commitment of the President of the United States. And that is a commitment that I intend to make. I can not and will not walk away from the genocide in Darfur. It is a commitment I also intend to make when it comes to another issue that I know has been talked about and that you and I care deeply about – ending the genocide in Darfur. Already, NJDC and the broader Jewish community has been a major engine in pressing the Bush administration to do more to stop the horrors in that region. But as you know, the President has not yet made a sustained effort to end the slaughter, and as I speak at this very moment the killings continue. As someone who has traveled to the camps on the border of Chad and Darfur where refugees beg America to step in and help stop a genocide that has taken away their mothers, fathers, daughters, and sons, I can not and will not walk away from this issue. When I am President, I intend to show the world that when we say, "Never again," that we mean it. And that means investing the full weight of the Presidency into ending that monstrous conflict and allowing the people of the region to begin the long and painful task of rebuilding their shattered lives. The world needs America to lead again. Its time for us to turn the page and show the world why we are still the last, best hope on Earth, why we are still a force for good, still a place where weary travelers can come from all corners of the globe and find hope and opportunity at our doorstep. It is going to require leadership around the world, but its also going to require some leadership here at home. It requires the kind of leadership willing to turn the page on the failed politics of the past, politics of division and indifference, politics that says when it comes to the challenges we face there is nothing we can do as a nation to solve them; that can’t-do-, won’t-do-, won’t-even-try style of leadership that we have become accustomed to over the last six years, the notion that we are all left to fend for ourselves in the face of enormous challenges. Some of you know that from the time I was a community organizer in the South Side of Chicago dealing with folks that had been devastated by steel plants that had closed throughout the region, I have always believed and practiced a different kind of politics, a tradition that says we are all connected as a people; that we have a stake in each other. That there are some ties that bind us together as Americans that despite differences of race and region and faith cannot be dissolved, cannot be broken. I said at the 2004 convention in Boston, if there is a senior citizen somewhere who is struggling, if right now somewhere in Washington there is a senior who thought he or she was going to be retiring but suddenly found themselves broke because the company they worked for decided to go through the bankruptcy courts to get out of their pension obligations, that diminishes us as a country, even if we are not the grandchild of that senior citizen. If there is a child somewhere who still can not read or is languishing in an underfunded city school or is unable to afford college despite being qualified and there are 200,000 young people around the country who fall into that category, then that makes us a lesser nation even if our children are taken care of. If there are veterans in the United States that are foraging through dumpsters after having served their country because they did not get the kind of services and treatment they needed, that diminishes all our patriotism. That basic idea, that we have got a set of commitments that are sacred -- that I am by brother’s keeper, that I am my sister’s keeper -- that kind of tradition has to express itself not just in our churches and our synagogues and our mosques, not even just in our families, it has to express itself through our government. And that is what I think has been forgotten over the last several years. We know the challenges that we face today – a dependence on oil that threatens our future, schools where too many children are not learning, families that are struggling from paycheck to paycheck. We know these challenges, we have heard them, we have talked about them for years. What has stopped us from meeting them is not the absence of sound policies and sensible plans. What has stopped us from meeting these challenges is the failure of leadership and the smallness of our politics, our preference for scoring cheap political points instead of rolling up our sleeves and building a working consensus to get something done. I have been in Washington long enough to know that it needs to change. For the last six years right here in Washington, we have been told that mounting debts do not matter. We have been told that the anxieties Americans are feeling about their health care costs and their retirement are an illusion, that climate change is a hoax and when all else fails – when Katrina happens or the death toll in Iraq mounts, we have been told that the crisis is somebody else’s fault. That it is the problem of gay people or immigrants or some other group that can provide us from a distraction from our failures. I know that some people say I have not been in Washington very long, but I will say this: I have been in Washington long enough to know that it needs to change. And that the kind of politics we have been practicing, a politics in which lobbyists and special interests are shaping the agenda as opposed to ordinary Americans, that that kind of politics has to come to a close; its time to turn a page on that politics. We could have universal health care. What has been lacking is the political will. It has got to change on health care, to stop talking about the problem to death while premiums and copayments and the number of uninsured keep rising. We know what we have to do in terms of dealing with the health care problem. We know we can get a better bargain on health care if we bargain together, that we can save money if we modernize our system. That we can bring together businesses and unions, doctors and nurses and ordinary citizens, and we can have universal health care in this country and there is no reason that we have got to wait eight or twelve years to do it. I have said and I will say again, by the end of my first term as President, there is no reason we can not have universal health care in this country if we spend enough money to do it. What has been lacking is the political will. It is time to turn the page on education, to move past the old debate that says the only answer is either dismantling our public schools or simply pouring more money into schools that are dysfunctional. We know what works here. We know that if we give our children early childhood education that it pays enormous dividends. We know that we can develop tests and assessment tools that actually measure what our kids are learning and do so in concert with teachers as opposed to in opposition to teachers so that they feel some ownership. We know that we have to recruit a new army of teachers who we pay more and support more and who we ask more of. And we know that we can make college affordable for every American who wants to go. There is no reason why we can not do those things. We know that its time to turn the page on our energy policy, or better stated, our absence of an energy policy; the idea that we have no choice but to send millions of dollars a day to Middle Eastern dictators and destroy our planet in the process. It is time to get serious about raising fuel standards. We need new ideas on energy. We need to tell our automakers it is time to get serious about raising fuel standards that have not been changed in 20 years, which is why I have legislation right now that says there is no reason why we can not raise four percent fuel efficiency on every car. If we had cars that were getting 40 miles per gallon, 43 miles per gallon, we would have to import zero oil from the Middle East. If they tell us that they can not afford to do it, if the automakers say they are struggling under the weight of the retiree health care costs, then we can say to them we will help pay for some of those health care retiree costs as long as the money that is saved is actually put into transforming your industry. And it is time to turn this crisis of global warming into a moment of opportunity for innovation and job creation and an incentive for businesses that will serve as a model for the world. We can do this right now and make future generations proud of what we do. Selma, Alabama: An American Story. It is time to turn the page. It is time to show the world who we are again as Americans. And it is time for our generation to tell a great American story. You know, I was down in Selma, Alabama, a while back. Some of you know I was there to celebrate the 42nd anniversary of the march across the Edmund Pettis Bridge and it was a powerful occasion for me in part because I went into community organizing, and in some ways I went into public life, because of the memories of those young people. Straight back, clear-eyed that were willing to get on buses and ride down on behalf of the freedom of others, because of the young people who stood up and faced fire hoses and dogs and tear gas on behalf of their own freedom. And as I was marching over the bridge and standing next to John Lewis, I thought about all those ordinary Americans who had participated in bringing about a more perfect union. And when I came back, some people slapped me on the back and they said, "Boy, Barack, you gave a wonderful speech down in Brown Chapel and that was a wonderful celebration of African American history." And I told them, "No you do not understand, that was a celebration of American history." Because at every juncture in American history, what has truly made a difference is when ordinary people got engaged and transformed their idea of what was possible. I am confident about my ability to lead this country as President. But I have said to the crowds that we are seeing all across the country I can not lead by myself. I can only lead with you. Because millions of voices join together and say that we can imagine something better, that we want to turn the page, that we want to write a new chapter. And the exciting thing for all of us is that what the American people I genuinely think are ready for. They are hungry for something different. They are hungry to see a politics that is crafted around common sense and pragmatism and optimism and a commitment to each other. And that is what all of you represent and I look forward to being a partner with you in making that happen. Q: You spoke very eloquently and it did strike many, many chords within. I was wondering, as you have alluded to the fact that education and health care are inalienable rights to every American, would you comment, please, on the crisis of affordable housing here in the United States? A: Well, this is nothing new. There is not a single metropolitan area in the United States where an individual who earns the minimum wage and works full-time can afford to find a place to live. This is an astonishing statistic. Not a single place in this country. And the reason is because the federal government decided we are going to get out of the housing business. That I think has been a fundamental mistake. The reason it was allowed to happen was because we conflated, or at least our politics at the national level cleverly conflated the genuine failures of some public house programs with our overarching commitment to affordable housing. And so, what I have said, and I have experience in this area, having worked at the community level, is that we need to break up some of the old models. Building high rises that, in Chicago for example, were built deliberately to segregate low-income people, was a mistake. Concentrating poverty away from others is a mistake. So we have learned some lessons. What we need to do is get community development corporations and faith-based organizations, synagogues, others that are interested in setting up not-for-profit 501(c)(3)'s, to build affordable housing that is integrated into the community. Integrated economically by the way, not just racially. And the federal government’s role then is to properly fund and subsidize those efforts. And we have the models to do it. I mean, the low income housing tax credit actually works, the problem is there is not enough of a credit out there, and that is something we have to significantly ramp up in conjunction with mayors and governors around the country who have some sense of what is actually happening in their home states. Q: Iran’s quest for nuclear weapons is a very complicated problem, but I have what I believe to be a very hard but very simple question: Can an Obama administration live with a nuclear-armed Iran? If so, how? And if not, how far will it go to prevent it? A: No, I do not think an Obama administration or any U.S. administration should accept the reality of a nuclear weapon in Iran. Not only is Iran the major state sponsor of terrorism, but the possibility of a ramped up nuclear arms race in the Middle East has horrendous consequences for the region, for the world and for U.S. security interests. I do not think we take any options off the table, including military, but I do think that our first line of offense has to be ramped up diplomacy and this administration subcontracted that diplomacy to the Europeans and others. We were not focused on it, this is one of the biggest tragedies of the war in Iraq is the degree to which it has strengthened Iran’s hand. And at this stage, we are seeing some recognition that we have got to tighten the economic sanctions towards Iran, get Russia, China, India and others who have more economic influence on Iran to join us in this process. I also think, though, that we should talk to Iran directly. I think the notion that not talking to countries, not talking to our enemies is punishment defies logic. It defies a bipartisan history of Republican administrations and Democratic administrations that for 50 continually communicated with the Soviet Union at a time that they were our mortal enemy. And we need to return to that sense of pragmatism and common sense, understanding that the threat of Iran is very real. One last thing, one last point I want to make because I addressed this in the speech that I delivered yesterday, we will be much stronger in our capacity to deal with Iran if we have got a consistent and overarching policy in terms of how to deal with nuclear proliferation. And the Non-Proliferation Treaty, has failed. We are looking at dozens of counties that are now thinking about pursuing nuclear power. We have not thought through how we renew the commitment of countries not to produce an enrichment cycle that allows them to do what North Korea and Iran is trying to do. And its very important for us I think to set up an international fuel bank that says if you want nuclear power, you can have it, but we will have an international body, not the United States, and this is why we have to do it in conjunction with Russia, we will have an international body that will enrich for you, but ensures that we are not increasing the proliferation of nuclear material. This is something that, by the way, Warren Buffett has already said that he would put up several million dollars, $50 million for, as long as he was matched two-to-one. It is wonderful for Warren to do that. The notion that we would leave one of the most important security issues that we face in the hands of private philanthropists is ridiculous and has to change. Q: If elected President in the next election, what are the first two issues you would address once in office? A: Issue Number One: I believe that the next President is still going to have to deal with Iraq. And I will be honest with you, I am not optimistic about the capacity of this President to recognize realities on the ground and make any significant change in course. That will occupy an Obama administration for quite some time. I will combine that, though, with a conversation with the world going before the United Nations and saying -- well I was going to say there is a new sheriff in town, but that is probably not the analogy I will use -- that we are open to doing business again. And that on a whole host of issues from what I just mentioned, stitching together a nuclear non-proliferation treaty back together again, to taking a serious international effort with respect to climate change, to looking at how can we work effectively with the International Criminal Court to establish the legal underpinnings of our war on terrorism. In all those issues I think we have an opportunity to say to the world we recognize that our security is wrapped up in yours, but we are not going to be able to communicate that message effectively without effectively dealing with Iraq. And I have already laid out the plan that I specifically mentioned. My hope is we make progress before that time. I can not say I am optimistic. On the domestic front, I will not restrict myself to two things, but I will start with the health care issue because I think that the time is right. One thing that has changed since 1994 is that businesses are feeling the pinch in a way that they were not before, and that means that we can potentially align many businesses with health care consumers to say we need to fundamentally change this system. That offers I think an enormous opportunity for us. The only other thing that I would add because I think it requires equal weight – the moment is also right for us to make some real progress on the energy front, with a cap and trade system for emissions, with a serious strategy to increase fuel efficiency standards on cars. I just proposed a low carbon fuel standard modeled on what is being done in California. If California can do it, there is no reason the whole nation can not do it. That is not only good economics and good environmental policy, but its also good national security policy. Q: Your rise in American politics has been a unique experience, we have never had anybody quite like you come up so fast and so quickly and so successfully, the question is this: Many of your supporters come from the Muslim-Americans and Arab-Americans who have supported you, the minorities. We are obviously friends with all of them, however, when it comes to Israel and when push comes to shove, how can you make us, as Jews, totally comfortable in addressing the issues in Israel and moving toward what no president has really been able to do and that is establish a peace? A: It is a fascinating question, but its based on an underlying premise that actually is false. My support within the Jewish community probably has been much more significant than any support that I have received from the Muslim-American community, although I welcome and actively seek support in the Muslim-American community as well. Those who have worked with me in Chicago in the state Legislature and now in the United States Senate will testify that I have not just talked the talk, I have walked the walk when it comes to Israel’s security. I think it is fundamental. I think it is something that is in the interests of the United States because of our special relationship, because Israel has not only established a democracy in the region but has been a stalwart ally of ours. What I have said and I will continue to say is it is in the interests of Israel to establish peace in the Middle East and it cannot be done at the price of compromising Israel’s security, and the United States government and an Obama Presidency cannot ask Israel to take risks with respect to its security. But it can ask Israel to say that it is still possible for us to arrive at more than just this status quo of fear, terror, division. That can not be our long-term aspiration. You know, one of the things that I am often frustrated about is this false notion that there is realism in foreign policy and idealism in foreign policy. The truth is we have to be very hardheaded and clear-eyed in terms of the dangers that exist throughout the Middle East and those that seek to perpetrate terror against the United States as well as Israel. But we also have to recognize that the status quo is not inevitable, that we can aspire to something greater and if we can find partners on the other side that are committed to recognizing Israel and committed to renouncing violence, that we have the need to reach out to them and we should want to have that difficult, tough discussion – but nevertheless have that discussion – about how we are going to arrive at what I think everybody wants, which is two states living side by side in peace and security. So my commitment to you is unwavering, but the only thing I will not do is to relinquish the possibility that our Middle East policy involves more than just arms sales and military and strategic options to consider. There has to be an effective diplomacy. And the one thing I will say, not just about the Middle East but about the world as a whole, the fact that I have lived in other countries, the fact that I have a grandmother who lives in a tiny village in Africa, the fact that I spent four years in Indonesia, so that if I go to Jakarta and address the largest Muslim country on Earth, I can say how are you doing, and they can recognize that I understand their common humanity. That is a strength. It allows me also to say things to them that other Presidents might not be able to say and that is part of, I think, what is promising about this Presidency. One of the things, I have said it before, I am in this to win, but I am not just in this thing to win a Presidency, I am in this to transform the country and I think that the possibility, not the certainty but the possibility of this campaign is that people get invested enough that through the process of this campaign and my Presidency, we do not just have America look at itself differently, but we have the world look at America differently. June and July 2007: Sen. John Edwards, Sen. Joe Biden, Sen. Chris Dodd, Sen. Barack Obama, Sen. Hillary Clinton and Gov. Bill Richardson speaking at the NJDC Policy Conference.